Political gridlock and years of Brexit drama haven’t dampened demand from wealthy Chinese for U.K. investor visas. 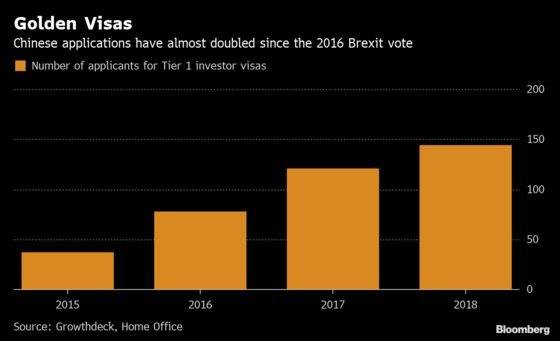 Chinese applications for Tier 1 investor visas rose 19 percent to 144 in 2018 from a year earlier, according to data obtained from the Home Office by private equity firm Growthdeck. The number applying has almost doubled since 2016, when the U.K. voted to leave the European Union. Chinese comprised 63 percent of the 228 applications last year, up from half in 2017, according to Growthdeck. Hong Kong was second with 26. The Home Office announced in early December it was temporarily suspending the visas to implement changes designed to tackle money laundering and organized crime. Less than a week later, it said it hadn’t imposed the freeze, without explaining why. Far from dissuading wealthy Chinese migrants, the uncertainty may have encouraged applications. “During this period, we saw a near fourfold increase in account applications,” said Farzin Yazdi, head of the investor visa offering at Shard Capital, which says it has helped with about a third of all petitions. U.K. Prime Minister Theresa May said last year that the government was reviewing the program after Labour Party lawmaker Yvette Cooper questioned the origin of money from 700 Russians granted the visas. 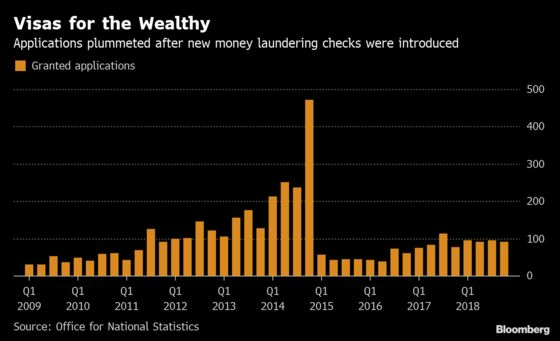 The number of applicants fell sharply in 2015 after the government introduced anti-money-laundering checks and doubled the minimum investment for the permit to 2 million pounds ($2.6 million). Since its December U-turn, the U.K. introduced changes last month that require applicants to prove that they’ve had control of the required 2 million pounds for at least two years, rather than 90 days under current rules, or provide evidence of the source of those funds. Investment in U.K. gilts are excluded from the plan. The data show that applications from Russians fell by half to 24 in 2018. The U.K. has long been an appealing jurisdiction for ultra-rich Russians as a safe and stable place to do business, hold their wealth and educate their children -- so much so that London has been nicknamed Londongrad. The decline is the latest sign that such appeal may be fading after the government crackdown following the poisoning of a former Russian double-agent and his daughter last year on British soil. May retaliated by expelling dozens of suspected spies. Russian tycoon Roman Abramovich was among those caught up in the tension, with the British government declining to renew his visa. He has since received Israeli citizenship. The U.K. remains an attractive haven for other nationalities. The slump in sterling has made U.K. assets cheap and other areas of the country’s economy offer attractive investment opportunities, according to Samuel Hu, head of overseas investors at Growthdeck. Government-backed immigration programs are common in other parts of the world. The U.S. offers EB-5 visas that let immigrants who create jobs stay permanently. Portugal has a golden visa program that allows foreign individuals to buy property valued at 500,000 euros ($561,000) or more in return for residency.